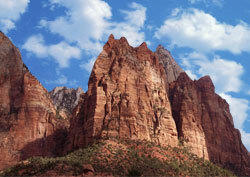 Zion National Park in Utah in America has a dramatic landscape of towering cliffs and nature-sculpted canyons. They draw nearly 3 million visitors per year. Be aware that temperatures on the main valley floor can exceed 38ºC (100ºF) in July and August. The ideal visit time is from May to mid-June, before temperatures and tourist counts surge. The colorful and invigorating fall foliage period (mid-October) is also ideal. Most Zion National Park tourists come only to see this 16-kilometer (10-mile) long gorge. Unfortunately, it can be jammed with visitors. To help alleviate that problem, private vehicles are now prohibited in Zion Canyon during the busy season. Free shuttle-bus service is provided. You can, however, drive your car in most other areas. This is a conversation piece. Most of this 25-kilometer (15-mile) footpath is not on dry land. Hiking entails wading through a river squeezed between cliffs soaring as high as 600 meters (2,000 feet). At one point, the passageway is just 6 meters (20 feet) wide. During the thunderstorm season (early-July through mid-September), flash floods lurk.